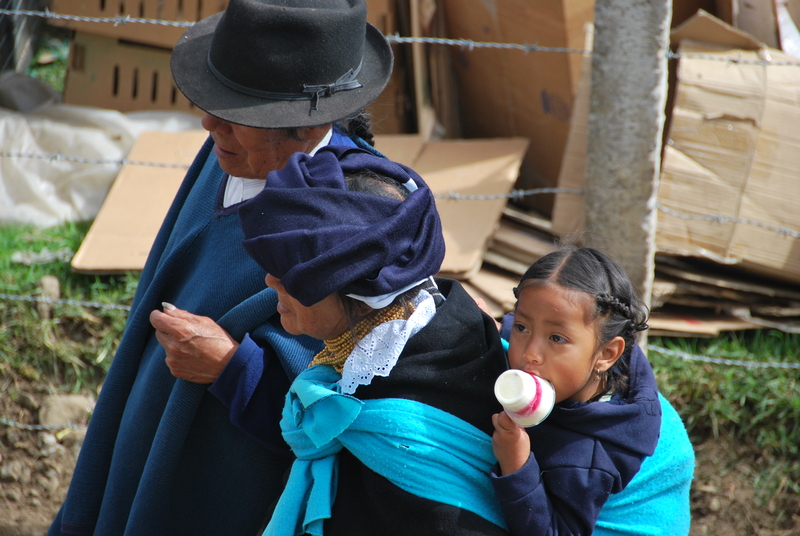 Otavalo definitely pulls in its fair share of tourists. 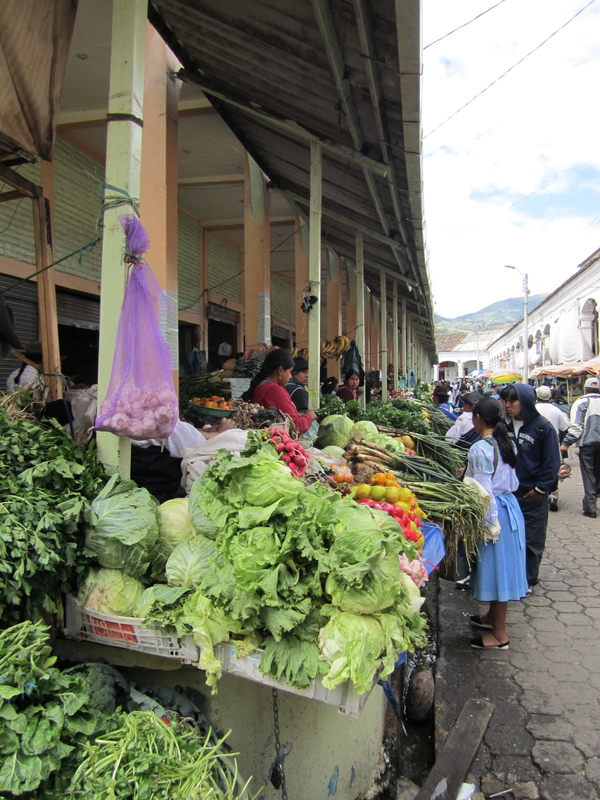 It’s a main stop in Ecuador for its market, which supposedly has been running for hundreds of years. 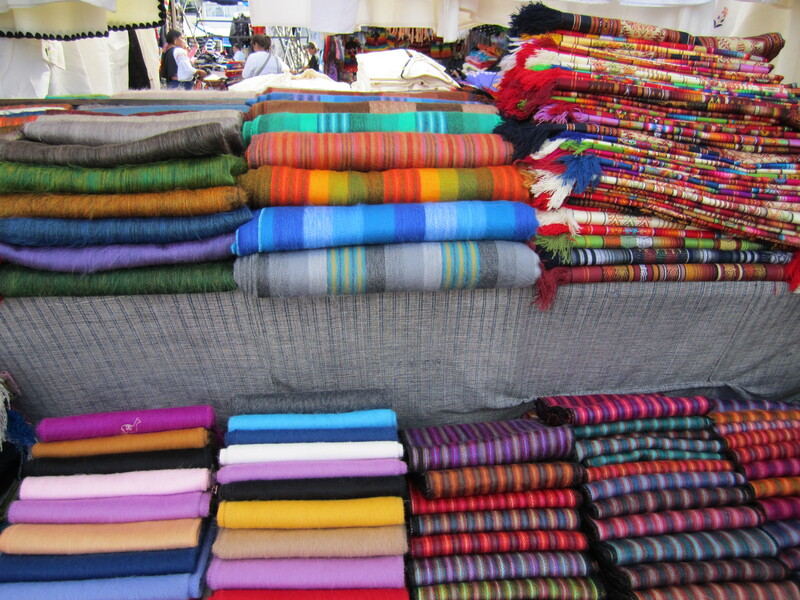 Everyday in Otavalo, vendors from the indigenous communities sell “handcrafted” goods in the Plaza del Ponchos. And yes, there are many ponchos for sale there. For the most part, the goods start all looking the same as you wonder around. It makes you really question the handmade claims when you see identical replicas everywhere you turn. The vendors are all nice, welcoming, and ready to bargain. Fortunately (or not), we could not buy too many items due to the size of our backpacks. As much as we wanted a big warm alpaca blanket, we simply couldn’t lug it around with us for the next 7 or so months. We had to satisfy our shopping urge by each buying a hat and scarf to prepare for the upcoming cooler climates. Bracelets: something small we could actually buy! 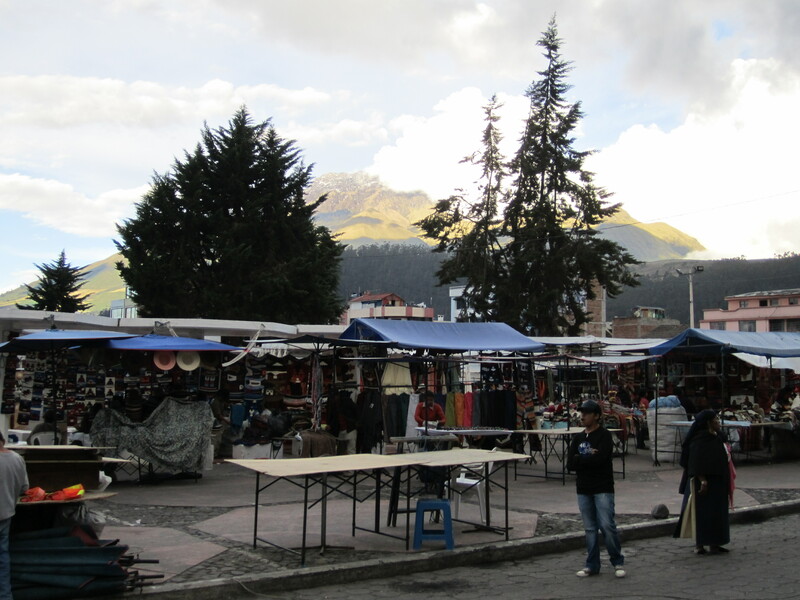 On Saturdays, this market takes over the town and indigenous people from the surrounding areas come in to town to buy or sell whatever they need for the week. 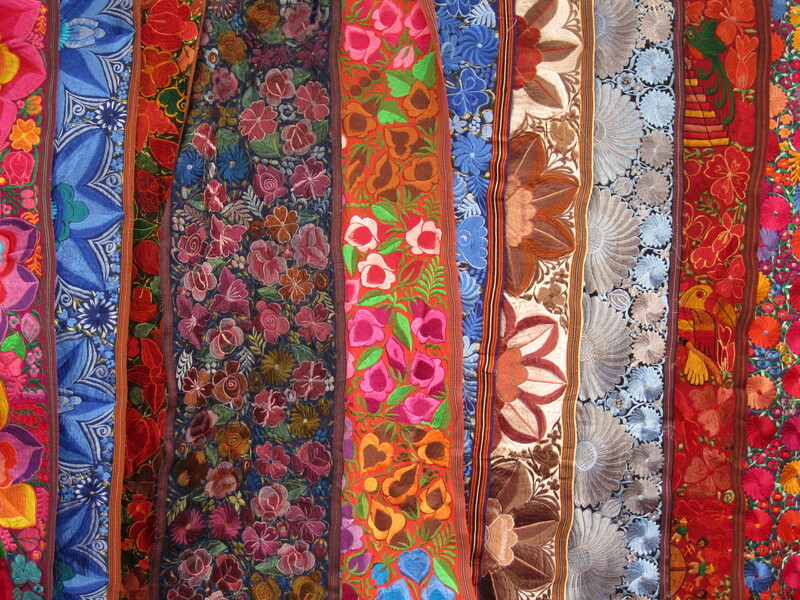 Not only does the handicrafts section grow, but so does the fruit and vegetable market. 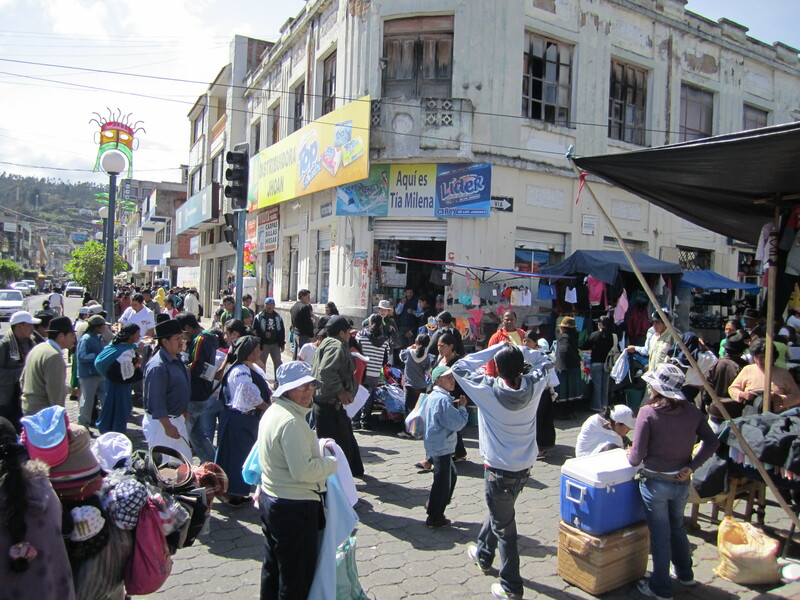 A few streets become the “practical” market full of clothes, shoes, and household goods. Also on Saturday mornings, there is an animal market that can be a bit overwhelming. Oh yes, and tourists come on Saturdays in droves. We literally saw more tourists during that first Saturday morning than we did during our entire time in Colombia. It was a bit of a change. However, the market (other than the handicrafts section) still has a very authentic and local feel to it. We stuck to people watching and “window” shopping in these areas on Saturdays. Taking in the scene at the market. I wish I had some ice cream! 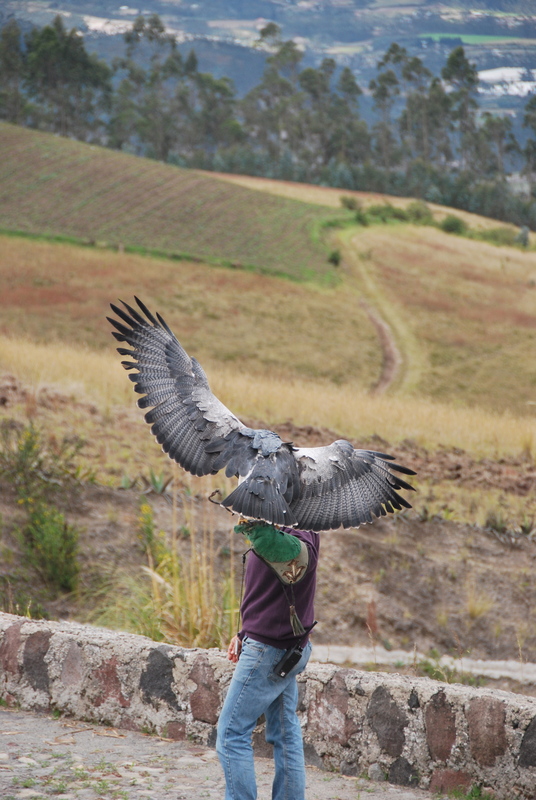 Escaping the market, we headed to the hills of Otavalo to visit the Condor Park. At first, we imagined this to be a small park featuring a few condors in tiny cages. Luckily, we were wrong and instead found an amazing bird park, with all sorts of raptors, owls, condors, and a few other birds. All the birds at this well equipped park were donated, because they were found injured or in need of attention. The cages were nice and large with a decent layout for the birds. We wandered around amazed at the different varieties, and we took more pictures than we probably needed to. 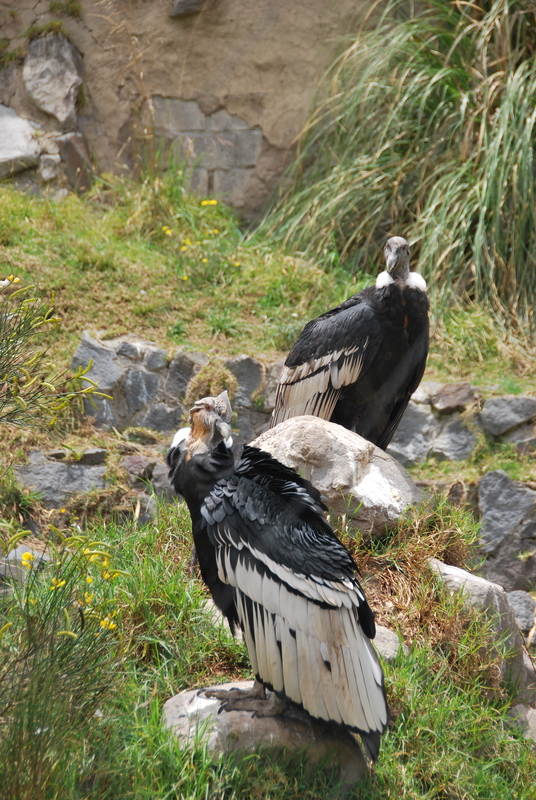 The main attraction, and what the park is named for, is the two condors in their large enclosure. For the most part, they simply hopped around their cage, jockeying for the best position to view the tourists. 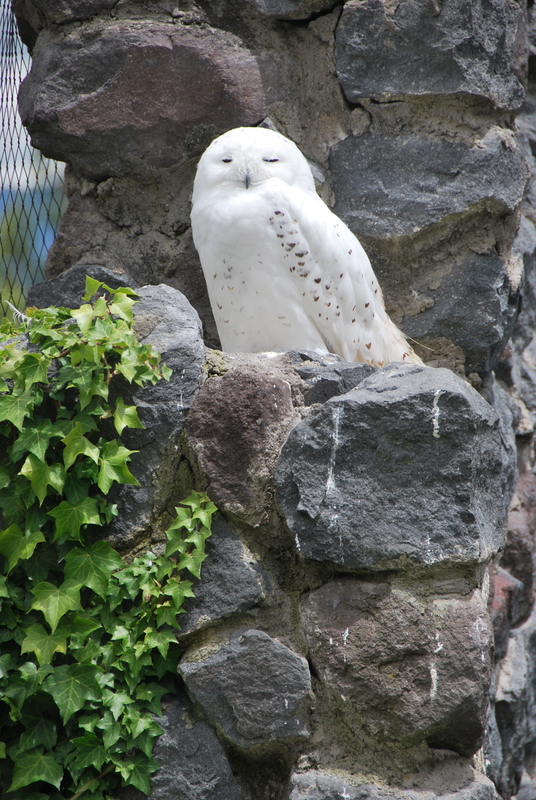 At one point, one took a quick flight around, and then we were able to marvel in its sheer size. These things are HUGE. They look like they could easily carry a small child away. Two times a day, they have flight demonstrations at the park. They brought a variety of raptors out to fly around the arena and wow the crowd. 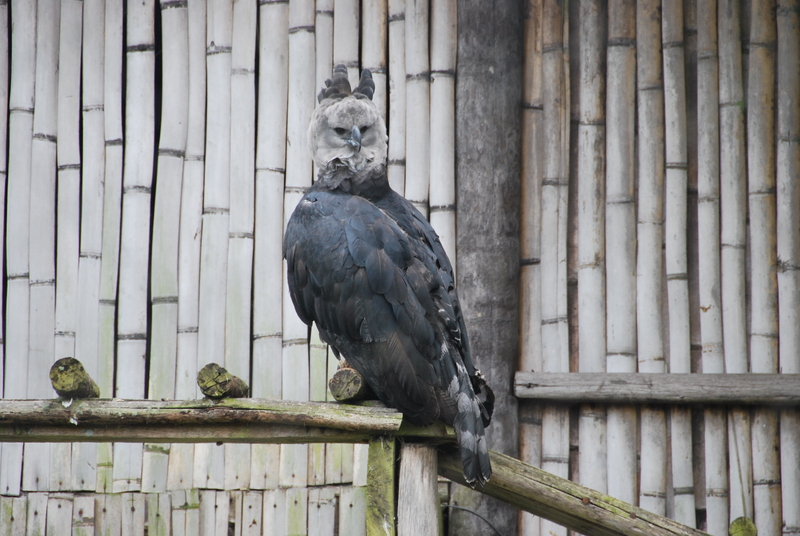 The final bird was a large bluish gray eagle which would launch off the caretaker’s arm and soar in the wind for a few minutes before returning. It was interesting to watch this powerful creature be so graceful. Eagle and handler - check out the wing span! After the demonstration, we left the park and explored other towns nearby. 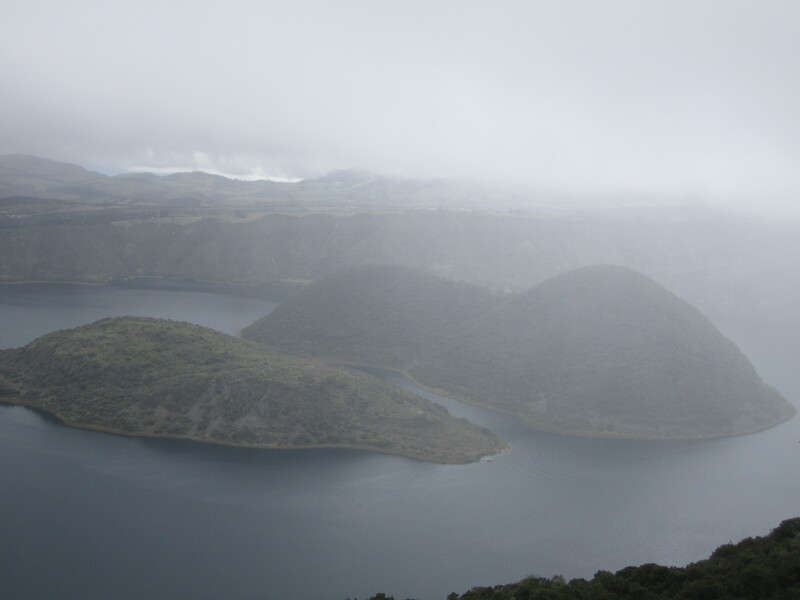 On another day, we headed up to approximately 10,000 feet for a hike around a volcanic crater. 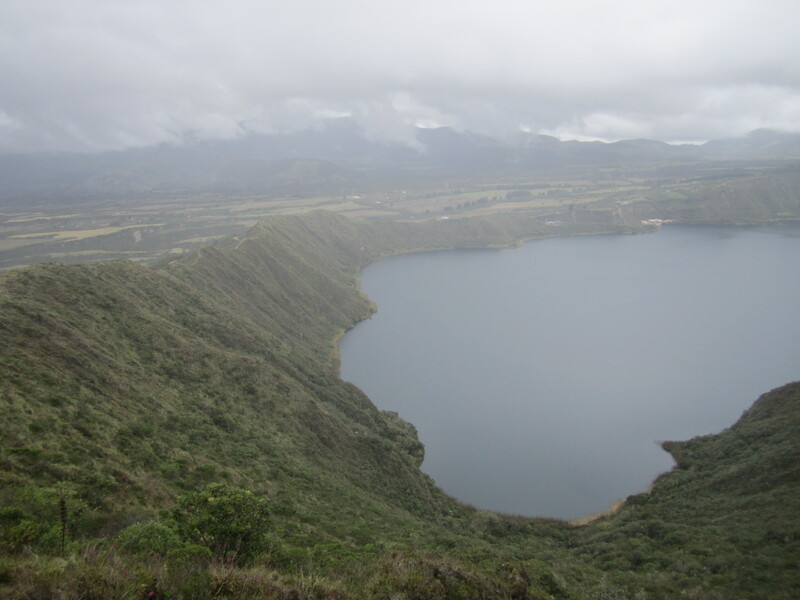 This crater is now filled with water, and has formed a nice lake with two islands in the middle. Supposedly, the islands look like guinea pigs (a.k.a. cuy), we couldn’t really see it. Upon arriving, the rain clouds started settling in, and the ranger advised us to quickly start on our hike in order to make it to the upper overlook before the rain. And to think this was the good weather! About and hour and a half later, and 1,200 feet higher, we reached what we thought was the upper lookout. However, the rain and clouds had gotten so bad that we could not tell for sure. You can hike a full loop around the crater, but not wanting to get any wetter than we already were, we made our way back down. It was a great hike, and a good chance to practice for later hikes at higher altitudes. This is what we were hoping it would look like…. 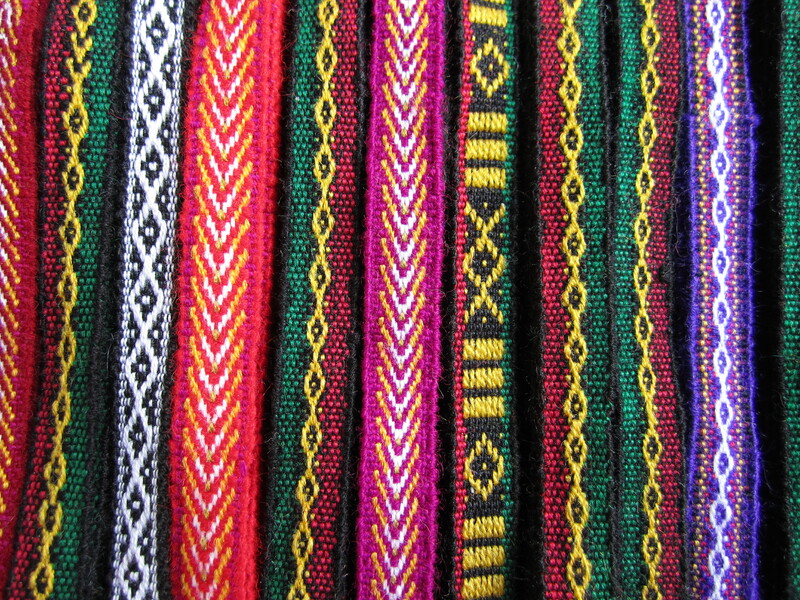 Cuicocha. We have learned on this trip that we are not always going to get the best weather, so you might as well enjoy what you have. We had a great hike and the view was still satisfying. Although, now looking back, hiking in cold rain was probably not the best idea health wise. 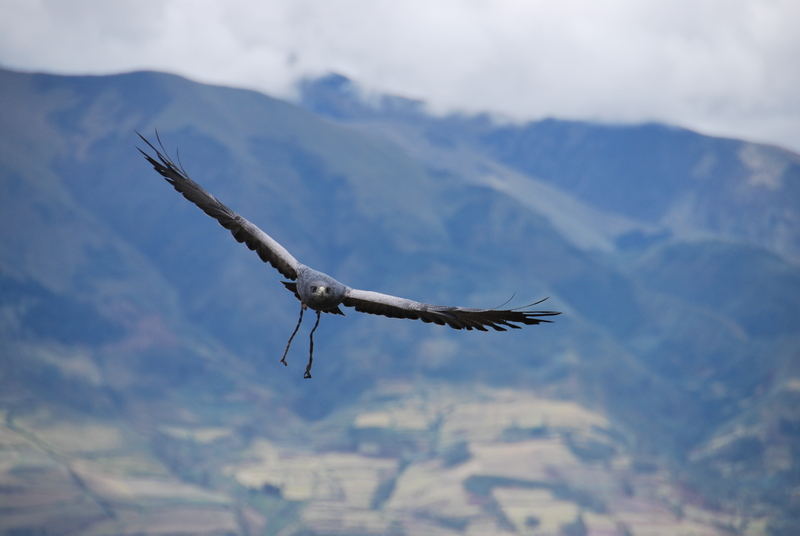 Next up: a quick stop in Quito and a malaria scare. Nice pictures. Those birds look awesome! Any time I hear of a condor, I just think of Rescuers Down Under. Is that sad? I would have been disappointed if you hadnt made a Harry Potter reference. 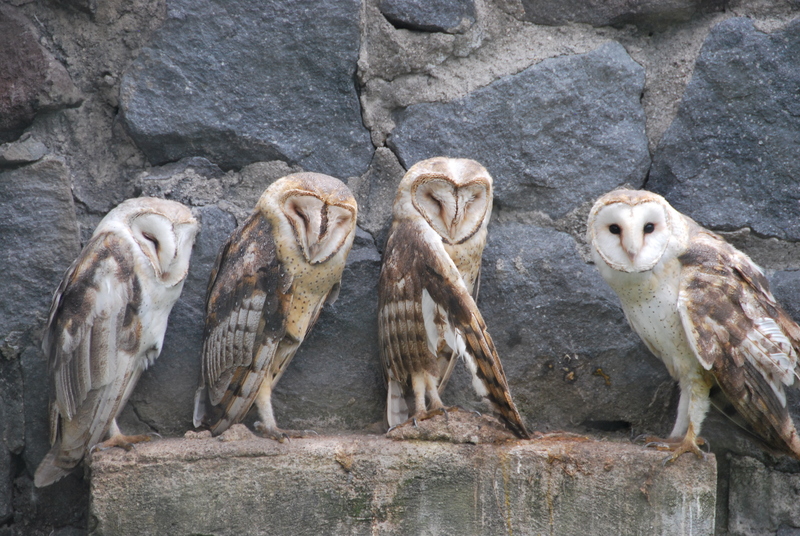 It was seriously all I could think of when viewing the owls! I was waiting for one of them to drop a letter, but it never happened. This is a great blog! I loved the pictures as well as reading about your adventures. I wish I would have read more blogs like this before booking my trip. 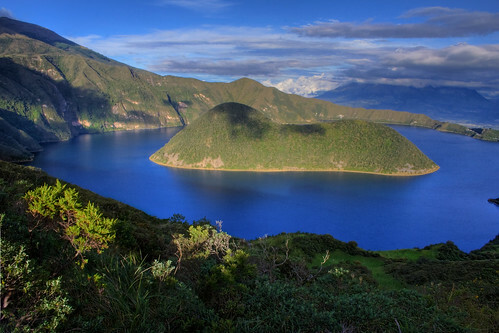 My husband and I are staying in Quito for seven days, but we are interested in seeing the Galapagos on our own. Go for it! The Galapagos were awesome!